Premier Doug Ford has quietly appointed an ally to an advisory post with a six-figure salary. Dr. Rueben Devlin was appointed by cabinet to serve as Ontario Premier Doug Ford's special adviser on healthcare, at a salary of $348,000 a year. Premier Doug Ford has quietly appointed an ally to an advisory post with an annual salary of $348,000. 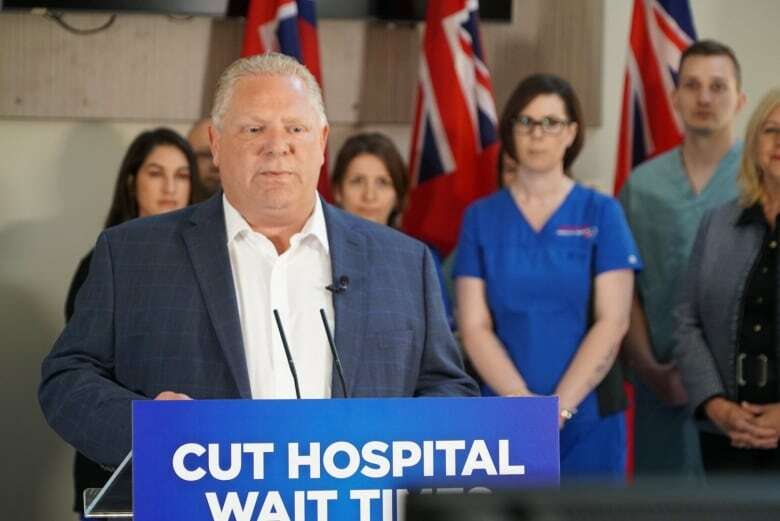 The Ford cabinet named Dr. Rueben Devlin, a former president of the Ontario PC Party and the longtime CEO of Humber River Hospital, to chair a new body called the Premier's Council on Improving Healthcare and Ending Hallway Medicine. The appointment was not officially announced by the Ford government, although the decision was made a week ago during the first meeting of the new cabinet. Devlin's hiring was revealed Friday when the orders-in-council from that meeting were posted online. The cabinet order declares Devlin's salary as $348,000 per year, plus expenses. "He is going to be worth every penny and we are going to see that in the results," said Lisa MacLeod, Ontario's new minister of children, community and social services, during a news conference Friday. Devlin was a senior advisor on Ford's election campaign and one of the members of his transition team. He served as president and CEO of Humber River Hospital for 17 years, where he was credited with transforming the facility into what's billed as the first fully digital hospital in North America, before retiring in 2016. The NDP is calling the move a patronage appointment. "The theme of Ford's early days in office has been backroom deals to benefit his wealthy friends, and nothing to actually fix health care," said France Gélinas, who has been the NDP's health critic and was re-elected as MPP for Nickel Belt. "We have a hallway medicine crisis in Ontario," said Gélinas in a statement. "But the solution to that crisis is more front-line staff like nurses, and more hospital beds, not handing over hundreds of thousands of dollars to a partisan ally." Devlin has long been involved with the Ontario PC Party. After the party lost the 2007 election, he led a move to oust John Tory as leader. Devlin "brings decades of experience to this role, and is well-respected throughout the health care sector," Ford`s spokesperson Simon Jefferies said in a statement. "Under Kathleen Wynne and the previous Liberal government there was a crisis in our health care system. Patients were waiting in hallways and broom closets for much-needed care." Ford made clear during the campaign that Devlin would play "an essential advisory role" in health care, said Jefferies. Devlin, an orthopedic surgeon by training, appeared at Ford's side in 2014 to make the announcement that the then-mayor of Toronto, Rob Ford, the premier's late brother, was being treated at Humber River Hospital for an abdominal tumour. There was some speculation Devlin would be named Ontario's deputy minister of health when the previous deputy minister, Dr. Bob Bell, announced his retirement shortly after the election. Instead, Bell's replacement is Helen Angus, who has served as deputy minister elsewhere in the provincial government and as a senior executive in healthcare agencies.